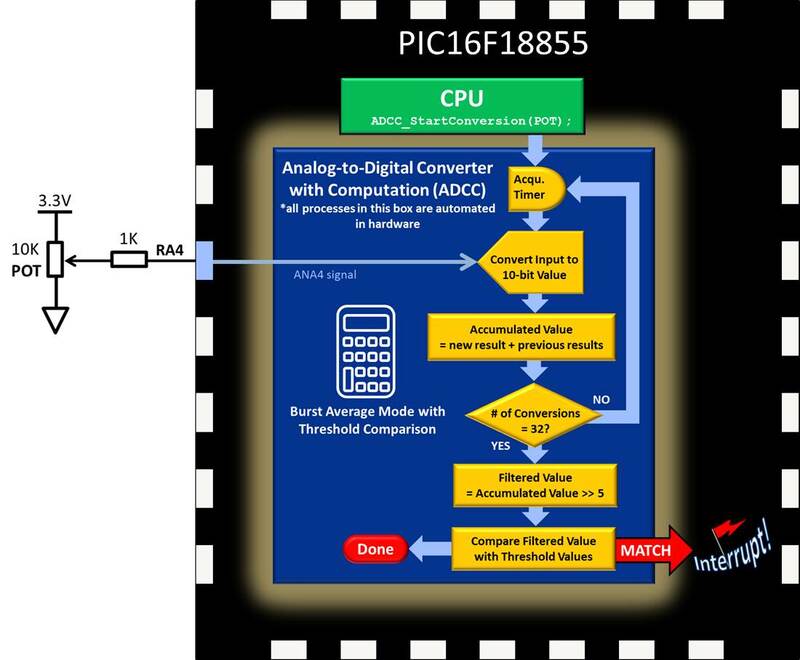 The Analog to Digital Converter with Computation (ADCC) can be useful for a number of applications. One is monitoring a sensor and then measuring the value against a set of thresholds. In this project, the voltage on the MCU pin connected to the potentiometer on an MPLAB® Xpress Evaluation Board is converted to a 10-bit value using the Burst Averaging Mode feature of the Analog-to-Digital Converter with Computation peripheral. This 10-bit Filtered Value is then compared against an upper and a lower Threshold value. An interrupt is generated when the Filtered Value is higher than the Upper Threshold value or less than the Lower Threshold value. 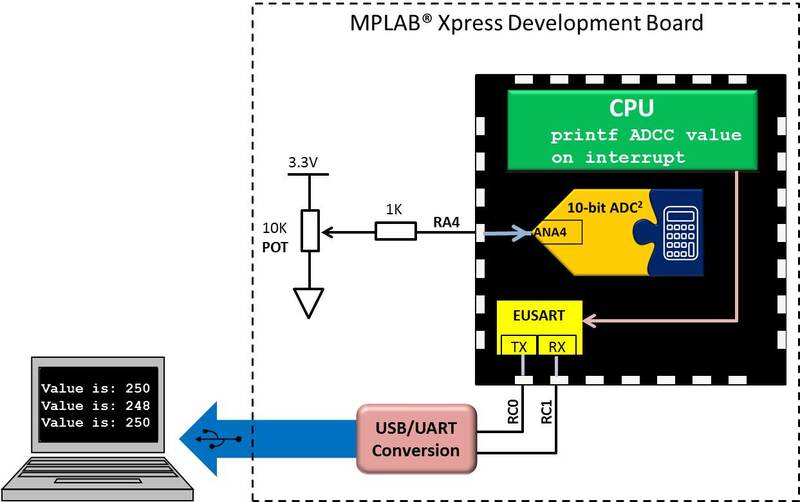 A printf statement is sent serially using the on-chip Enhanced/Addressable Universal Asynchronous Receiver Transceiver (EUSART) to the PIC® PIC16F18555 on the MPLAB Xpress board for conversion to the USB protocol. The message is then displayed in a terminal program running on a host computer to confirm that an interrupt has occurred. 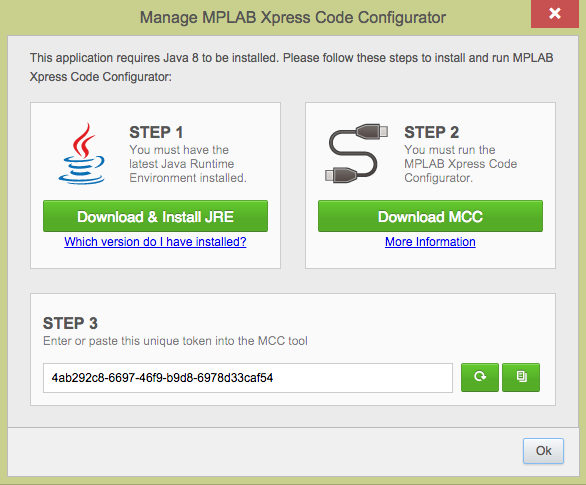 To follow along with these steps, MPLAB Xpress should be open and you should be logged in so that the MPLAB Code Configurator (MCC) plug-in can be used. 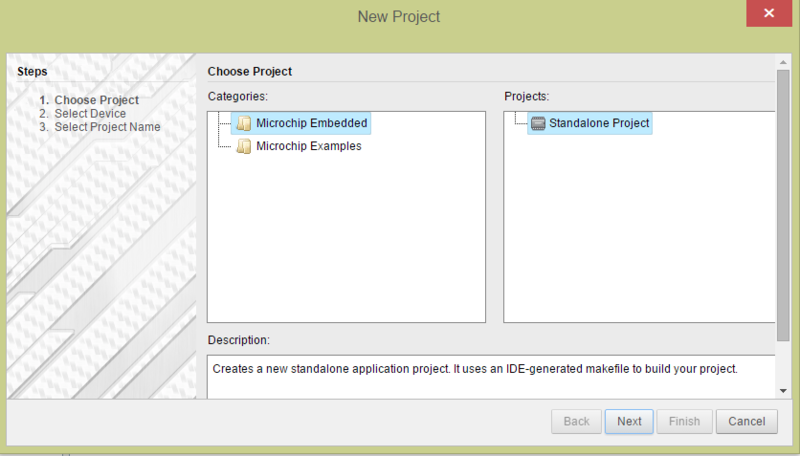 Create a new project in MPLAB Xpress for a PIC16F18555 using the MPLAB Xpress Development Board called adccThreshold. 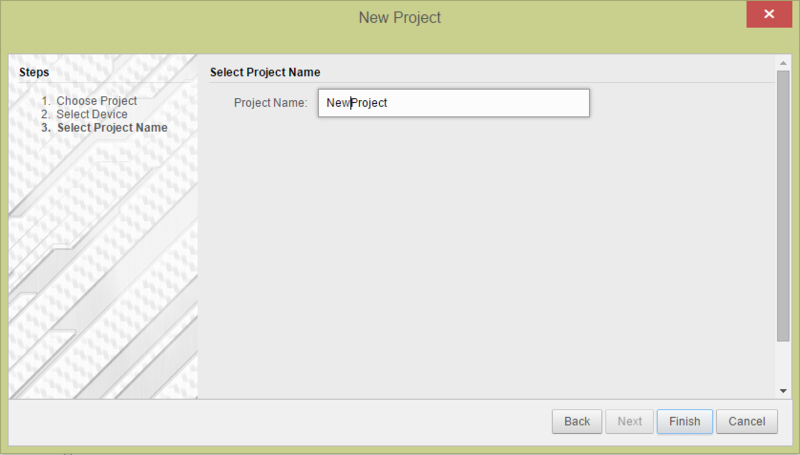 Ensure that Burst_average_mode is selected in the Operating drop-down menu. 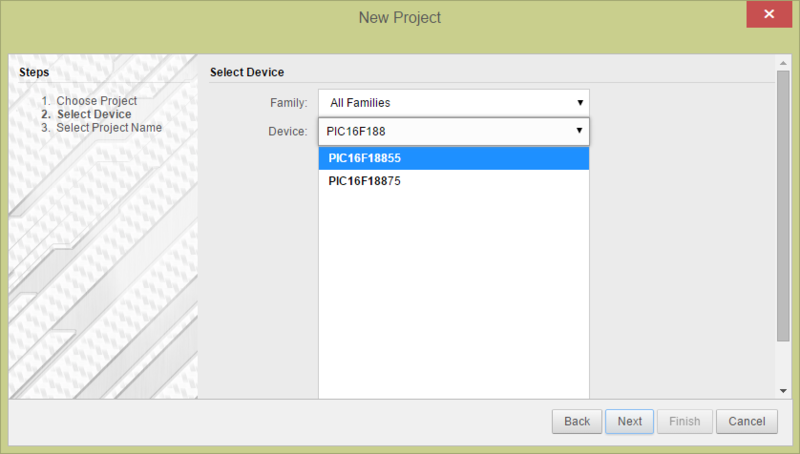 Select FOSC/ADCLK from the Clock Source drop-down menu. 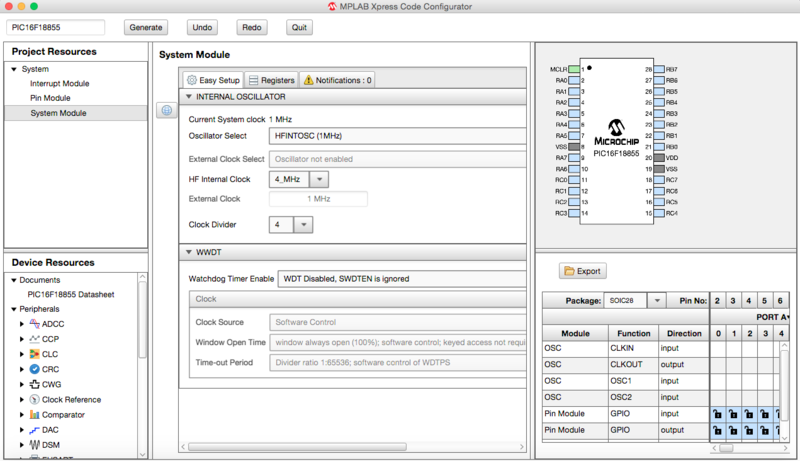 Select FOSC/2 under Clock to obtain an ADCC Clock period (TAD) of 2 µs. Enable Continuous Operation. This feature will continuously sample the input pin once the ADCC is triggered until the threshold conditions set up below are met. Enable Stop on Interrupt. 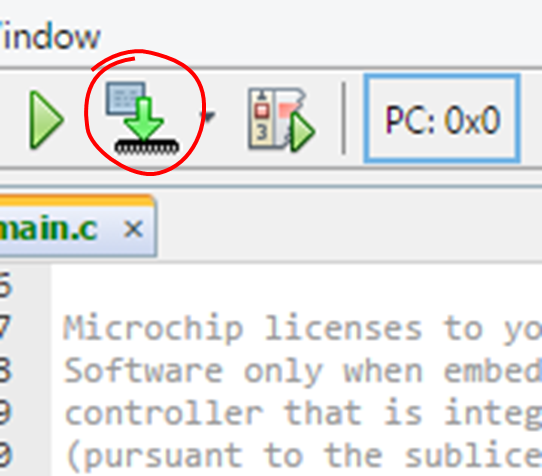 This feature will stop the conversion of the selected input pin when an interrupt has occurred. Note that the user code will need to re-trigger the ADCC with every interrupt. 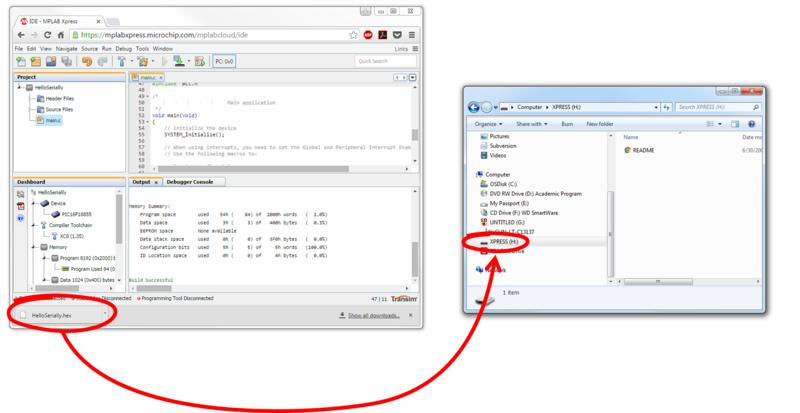 Select Filtered value vs setpoint from the Error Calculation drop-down menu. This will be the average result (Filtered Value) after the Burst Averaging has completed minus the Setpoint Value. Leave the Setpoint at 0. Therefore, the calculated error value will simply be the Filtered Value. Set the Repeat to 32 consecutive potentiometer pin reads every time the ADCC is triggered. Set the Acc Right Shift value to 5. This will shift the sum of all 32 consecutive potentiometer pin conversions to the right by 5 bit positions effectively dividing the accumulated result by 25 = 32. Enable ADC Threshold Interrupts and define the Threshold Interrupt condition by selecting ADERR < ADLTH and ADERR > ADUTH. This means that an interrupt will occur if the calculated error value (Filtered Value - Setpoint) following the Burst Averaging and right shift of 5-bit positions is either greater than the Upper Threshold value of 500 or less than the Lower Threshold value of 100. The Computation Feature section should now resemble the image below. 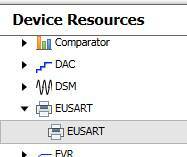 In the Device Resources pane, scroll down to locate the EUSART heading, expand and double-click to add the EUSART peripheral to the Project Resources > Peripherals section. Return to the MPLAB Xpress IDE and open the adcc.h header file found in the Project\adccThreshold\Header Files\MCC Generated Files folder tree. Scroll down through adcc.h to locate the function ADCC_StartConversion(). This function triggers the ADCC conversion. Remember that the ADCC will continuously re-trigger after each Burst Averaging has completed to obtain a new Filtered Value and will only stop when an interrupt has occurred. Highlight the adcc.c source file for the ADCC peripheral under the adccThreshold\Source Files folder in the Project pane of MPLAB Xpress IDE. Scroll through adcc.c to locate the function ADCC_ThresholdISR() at the bottom of the file. Add a printf statement to transmit the Filtered Value over the EUSART to confirm that an interrupt has occurred. Immediately following the printf statement, add another ADCC_StartConversion() function call on the POT pin to start another round of ADCC input samples. 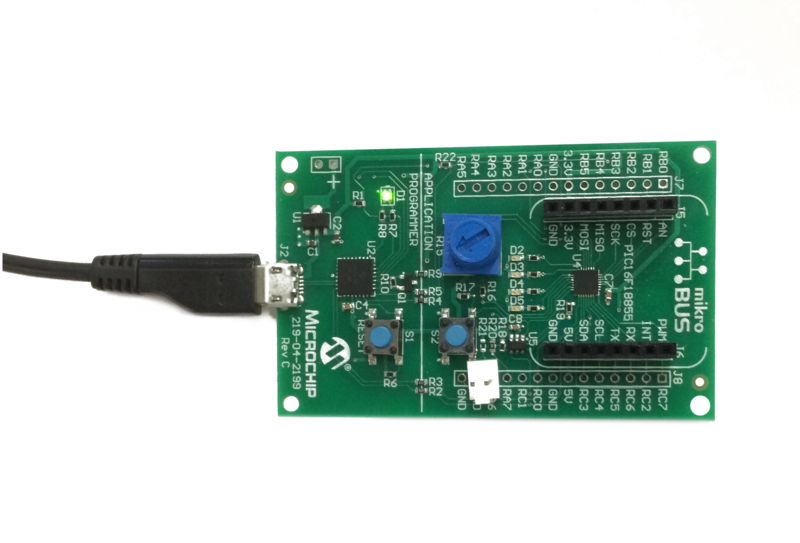 The MPLAB Xpress Evaluation Board should be connected to an available USB port on the host computer through a USB cable to the micro B connector on the board. Drivers should install successfully the first time the board is connected and may take a minute or so. The connection is shown in the picture. No other components are required. Open a terminal program on the host computer select Connect. In this example, we are using the free program CoolTerm.